^ a b c d e "3DO – 1993–96 – Classic Gaming". Classicgaming.gamespy.com. Archived from the original on 2012-04-15. Retrieved 2012-07-31. ^ ""Panasonic 3DO FZ-1 manual"". Archive.org. Retrieved 25 April 2018. ^ Vinciguerra, Robert. "Tom Kalinske Talks About His Time Overseeing Sega As Its CEO In the 90s; Reveals That Sega Passed On Virtual Boy Technology, Considered Releasing 3DO". The Rev. Rob Times. Retrieved 21 September 2015. ^ "Atari Jaguar Unveiled—Stalks 3DO". Computer Gaming World. November 1993. pp. 10–11. Retrieved 28 March 2016. ^ "The Face of the Future". Computer Gaming World (advertisement). December 1993. pp. 32–33. Retrieved 29 March 2016. ^ a b "The Best -- and Worst -- Console Launches". Yahoo! Games. November 8, 2013. Retrieved 2014-01-30. ^ "3DO Today". 3DO Today. Retrieved 2012-07-31. ^ a b "Panasonic 3DO". Video Game Console Library. Retrieved 2013-11-18. ^ "3DO Press Release". Cs.cmu.edu. 1994-08-24. Retrieved 2012-07-31. 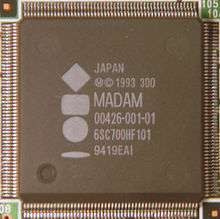 ^ "System 16 – M2 Hardware (Konami)". System16.com. Retrieved 2012-07-31. ^ "3DO is number 22". IGN. Retrieved 2012-07-31. ^ "4DO website". www.fourdo.com. Retrieved 2015-06-07. ^ "Compatibility List - 4DO Wiki". wiki.fourdo.com. Retrieved 2015-06-07.